If you planted seeds or seedlings in late spring, your tomato plant should be coming to fruition right about now. 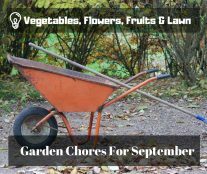 But if you are seeing problems instead of perky ripe tomatoes, you might need to troubleshoot your garden. The tomato struggle is real. Match your tomato plant issues to the right solution and get your garden growing! Tomato Trouble #1: You see cracks or splits in your tomatoes. If cracks are appearing on your fruit, you probably haven’t watered your plants evenly. Or perhaps your garden received a big rain after being dry for a while. To prevent cracks and splits in the future, you may want to invest in a simple drip irrigation system, like a soaker hose, to water the soil evenly every time. A layer of mulch on top can also help retain moisture. 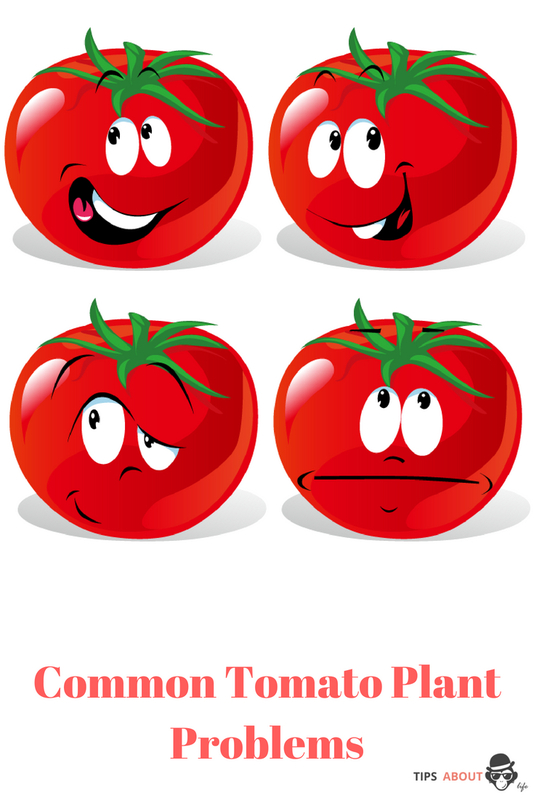 But beware: some types of tomatoes are just more likely to crack, including those with thin skin, like many heirloom tomato varieties. Tomato Trouble #2: The leaves of your tomato plants are yellow or just downright funky. Curled, deformed, or yellow leaves are often an indication of an aphid infestation. Look for the hungry little bugs on the undersides of your leaves, especially under new ones. They are tiny but clearly visible, and can be easily taken care off with a blast of water or a spray of neem oil, a natural plant pesticide. Tomato Trouble #3: Flowers drop off without producing fruit. Your weather has been crappy. Daytime temperatures above 85 degrees or nighttime temperatures below 50 degrees are not conducive to growing tomatoes. Too little sunshine can also cause this problem. Wait for the weather to improve and try again. Tomato Trouble #4: Your tomatoes don’t ripen all the way on the stem end. It’s been too hot and/or too sunny for your tomato plant if the stem end on the fruit stays green or yellow. 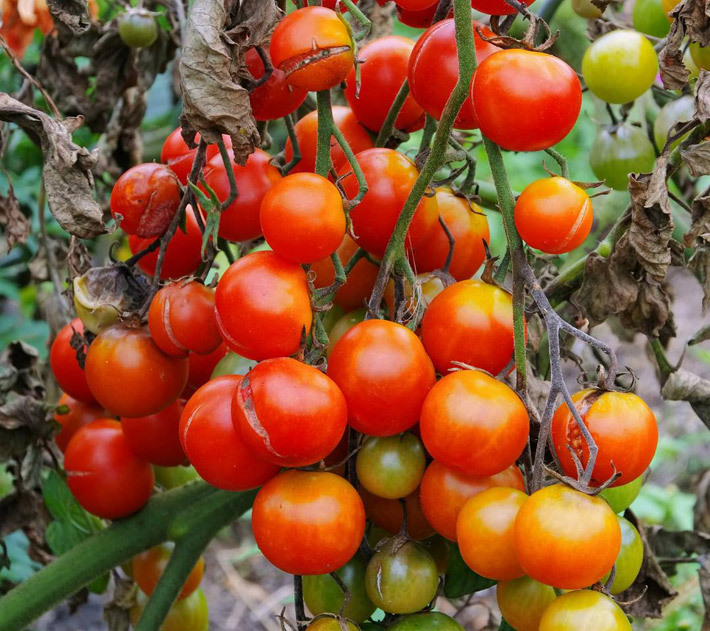 “Green shoulders” means that the chlorophyll in your plant isn’t breaking down well or at all, and “yellow shoulders” is a sign that your fruit cannot produce lycopene. Guard against pale shoulders in the future by providing your plants with extra shade during hot, sunny summers. Tomato Trouble #5: There are holes in the leaves or fruit of your tomato plant. Your garden probably has a guest, most likely a tomato hornworm or a slug. Tomato hornworms are big, green caterpillars that can be plucked off by hand. If slugs are chomping your plants, you can create a copper border for your garden using pennies or a stripped electrical cable. Slugs don’t like crawling over the metal. Another option to banish slugs is by introducing beneficial nematodes (friendly bugs) to your garden. But skip the slug pellets, which are not organic and will kill friendly beasties, too. Tomato Trouble #6: Tomatoes are turning black on the bottom. 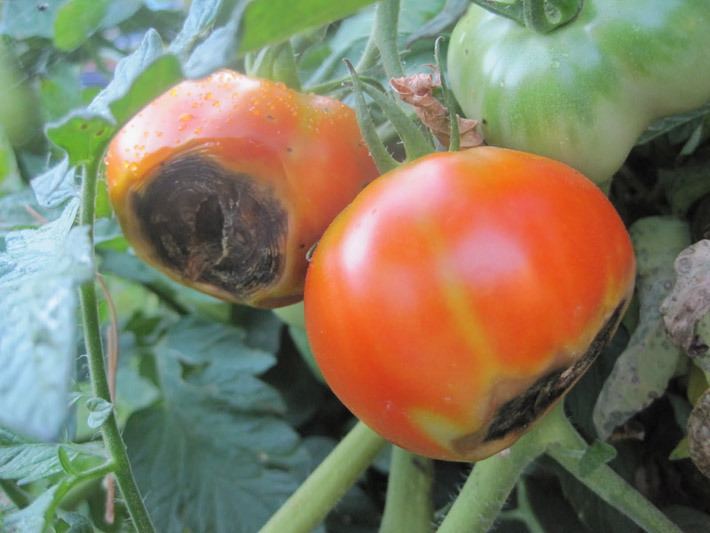 Sounds like blossom-end rot, which is most often caused by a lack of water. A layer of mulch can help keep your plants moist throughout the season. If watering has not been an issue, your blossom-end rot may be caused by too little calcium or too much nitrogen in the soil. Use a correctly balanced fertilizer to amend the situation. Tomato Trouble #7: Wilted leaves predominate.